I’d done some outdoor climbing in the past, but I’d always done top-roping – where you hike to the top, set up some gear and thread a rope through it, and then go back to the bottom and climb the same way you would in a gym. This time, we were trad climbing – one person attached crap-tons of gear to their harness (they sounded like goats with bells on, scrambling around the rocks). Then, as they go up, they wedge safety gear into the rock. Trad climbing is really dangerous, because if you fall, you fall pretty far, and there’s no guarantee your safety gear will hold up. So I stuck to pretty tame routes this time, especially as I was getting the hang of it. The first thing I “led” was about twelve feet high, and the guidebook designated it as a scramble. 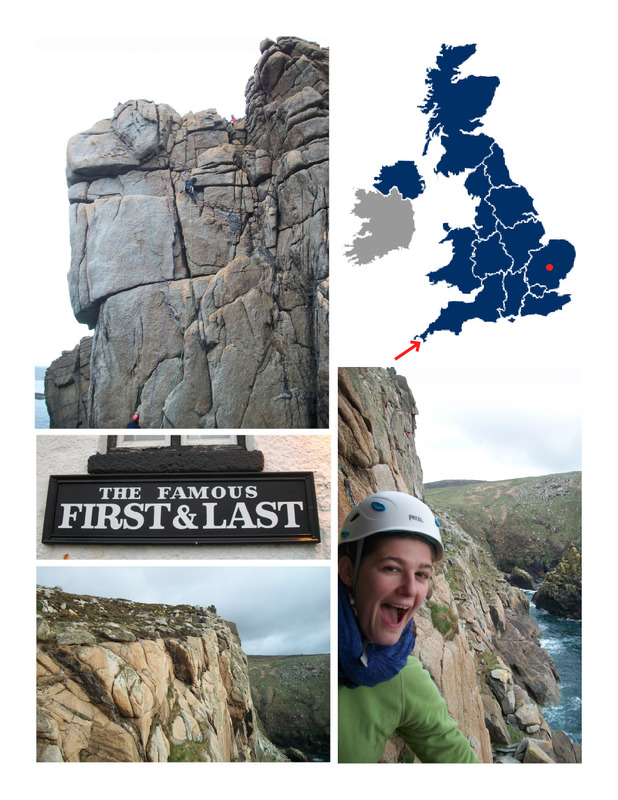 I learned so much this weekend – about Cornwall, about climbing, about all the people I shared a trailer with (its called a caravan in England. The walls were so thin you could hear someone brushing their teeth from the other end of the thing. seriously.) And also how much bigger England is than I realized. Cambridge is the red dot above – and we went allllll the way to Land’s End. It took a lot longer than I expected when I blithely agreed, via text, that sea cliff climbing would be awesome. I already can’t wait to go again.